Kung Fu Traveler has already made a big splash in China where it was produced to premiere exclusively on iQIYI, a Chinese streaming service. When it arrived on iQIYI and the China Movie Channel last year, the actioner generated more than 20 million views in the first week alone. Now the movie is about to cross the water into North America. After the alien invasion, General Jie, played by Tiger Hu Chen, of Man of Tai Chi (review) and The Matrix fame, is accidentally sent into the past. From what I can piece together Jie and his partner, have to use the limited technology they have taken with them to defeat the alien invaders. The actual plot of the movie, beyond the alien invasion and time travel broad strokes, are very vague so it's hard to tell when most of the story unfolds but from the longer trailer below, it looks like most of the movie's action takes place in the past which doesn't look quite as interesting as the "present" but alas, could still make for some great action sequences. The alien design looks fairly interesting and though the VFX in the trailer look OK, the one explosion which looks hokey enough that it's unclear whether the quality is there for the entire movie. This could easily end up looking like a Syfy original. 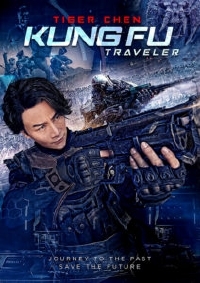 Kung Fu Traveler will be available on DVD April 3.